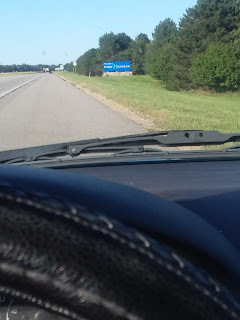 Note: Many of you know that I recently spent some time in the Carolinas helping a friend move his boat. I am working on a full report of this epic trip. In the meantime, here is a reflection on life in the boatyard. Gratitude runs in surplus aboard sv Emma. Even as I lay a bit low this week, not wanting to spend much money for I have a bill of some unknown heft coming from the marina. Still, I sleep every night under Emma’s forward hatch. The stars peak from behind clouds in a nightly game of hide and seek with the moon. The summer heat and humidity have not yet come and each night a soft, cool seabreeze caresses my cheek. It is lovely. It is relaxing in a way that I cannot begin to describe. remember a single instance of an abrupt downpour soaking me. Little, shy drops of rain, who seem embarassed to have to wake me, will drop one by one ahead of the storm. It only takes a few and I awake to the coming rain. 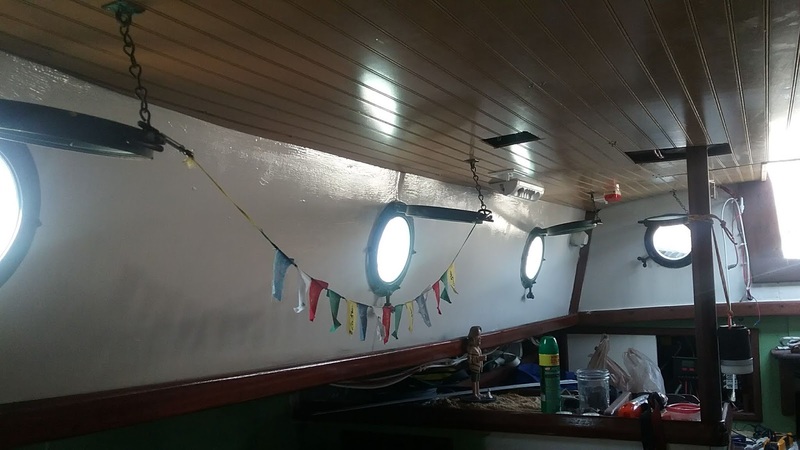 There seems to always be time enough to rise, close the hatch, check the rest of the portlights and the companionway. Crawling back into my still warm berth to resume my rest seems a decadence for which I couldn’t possibly qualify. Last night most all the above procedure went off without a hitch. A few discreet drops on my forehead and I arose. The forward hatch came down -- I set the little bracket that allows me to leave open just a crack. 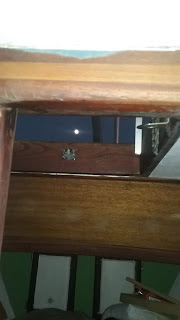 I walked aft to make sure that my portlights were closed and checked if the wind was pushing rain into the companionway. I don’t have dropboards yet, just a piece of plywood cut to fit. Many nights this board is not closed; just leaning against the opening to allow a bit of air to flow. A fan was running so I squinted to check the amps left in my battery bank. The amps are displayed on the charge controller which is mounted in a cabinet next to the companionway. 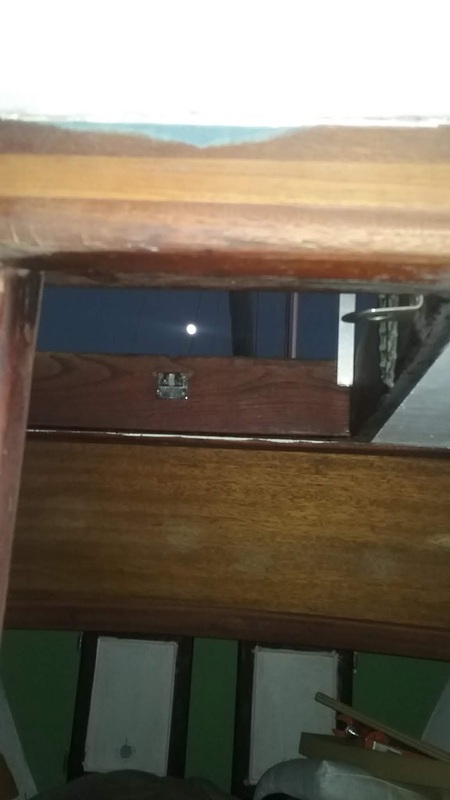 As I leaned a bit over the counter to make out the unlit display, something wasn’t quite right about the board in the companionway. It was one of those all-too-human moments when you’ve seen something but it takes a bit longer than usual for the perception, or a clear enough perception of that thing to soak into your brain. Simultaneously, I realized both that something was sticking up on what should have been the flat top of the board AND that I was being watched! 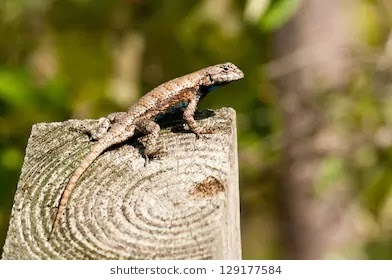 Florida has lizards. Even if you’ve only vacationed here once, you've probably seen our little lizards scurrying around. They seem to thrive at the edges of landscaping and in other shady spots. Here, they run around among the shadows of boats on the rocks and the cement of the boatyard. For some reason, one of these ubiquitous lizards was checking me out in the middle of the night. The lizards have a pulsing stance. I suspect it’s their breathing, but it might just be a tense awareness. I could just see the top of this lizard’s head, bobbing slightly. He seemed larger than his local brethen I’ve seen. We stared at each other a moment; his head bobbing slowly as the gears of my brain rattled and ground. Then I gently bumped the board and he or she ran off. I’m not sure what their intentions are but I’m not really looking for a summer roommate. I needed to giggle.......LOVE the way you write!! AND YES, it has been cool, we're enjoying the sounds of the rain right now. Guess paint work is postponed?